Wuzzit Trouble teaches numeracy while steering clear from math’s traditional symbols and syntax. In Wuzzit Trouble, the goal is to free the Wuzzits, those cute, teddy bear-like creatures who accidentally got stuck in traps. 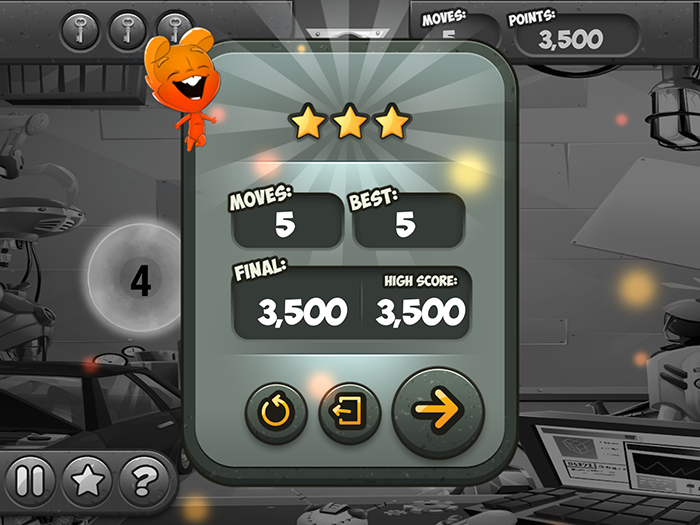 To do so, the player must collect keys found at specific numbers on a 0-65 wheel by tapping and turning small gears to align the keys with the pointer. To visualize this better, imagine a lock that must be opened by entering a combination. However, the small gears enabling the player to turn the wheel can only be moved by a set number each time. In the basic Wuzzit Trouble game, there are three rooms to explore: the Botany Lab, the Invention Room, and the Future Tech Lab, each comprising 25 puzzles of increasing difficulty. 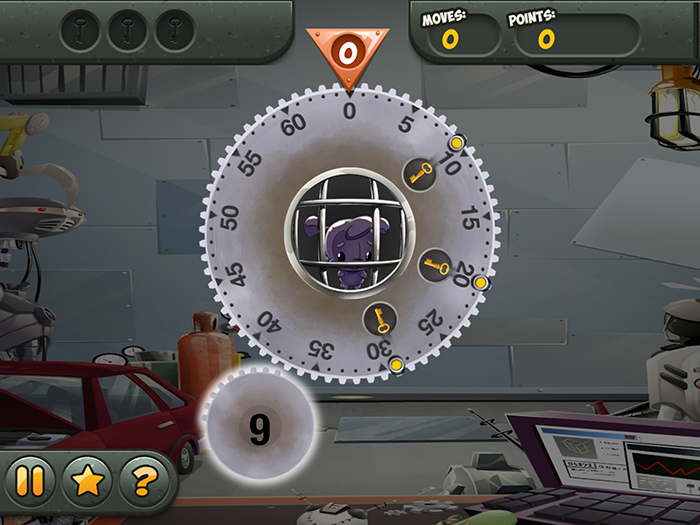 For example, in the first puzzle of the Botany Lab, the player must collect a key positioned at “10,” the small gear moving the wheel by five notches each turn. The player could turn the gear forward and move to “5,” then move it a second time to get to “10” in a total of two moves. Alternatively, they could tap and turn the gear forward twice before releasing it in order to reach “10” in a single move. 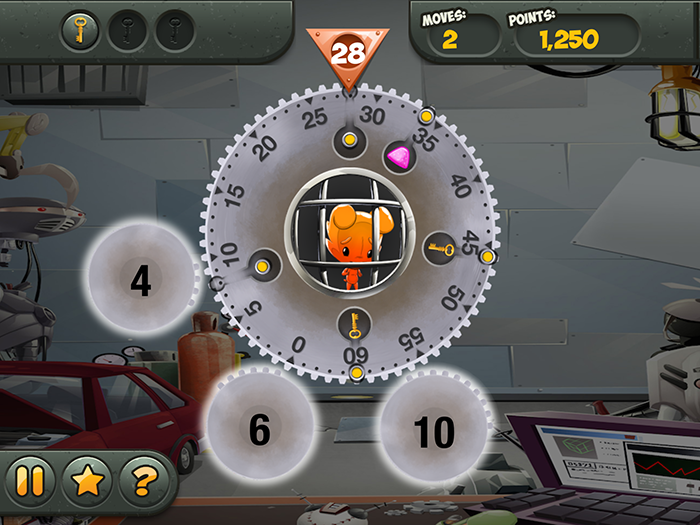 In Puzzle 25 of the Botany Lab, there is a key positioned at “29” and a treat for the trapped Wuzzit at “38.” In this case, the small gear moves the wheel by nine notches each turn. If the player taps and turns the gear backward five times before releasing it, they will collect both treat and key in a single move. Overall, the gameplay is repetitive in the sense that it remains the same across all puzzles. Nevertheless, there is replayability in the three-star system: Collecting all keys will reward the player with one star; doing so under a specific number of moves will earn them two or three stars. Although the Wuzzits are quite adorable, they don’t feel fully integrated into the gameplay. We barely see them behind the bars, and they don’t do much when they appear on the “victory” screen. It would have been nice if, for example, we could see them holding or eating the treat we collected for them or if they cheered when we freed them from their trap. The puzzles in the first room are quite simple, but already they enable the player to get a good sense of what adding, subtracting, or multiplying a number looks like, in a way that’s quite different from doing an equation. The subsequent rooms and puzzles offer greater challenges, with multiple keys and treats to collect using more than one gear. If a player makes a mistake, they can visualize it by seeing how far they are from the key or treat they were hoping to collect, which I’m sure is useful for players who have difficulty manipulating numbers and reading number lines. With the three-star system, the player can strive to optimize their operations and look for strategies that will enable them to save the Wuzzits in the least amount of moves possible. This adds a good sense of progress to the game: The player feels more competent in math as they go along. Wuzzit Trouble, which enables students to conceptualize math in a new way, would be a great tool in 1:1 classrooms. Available on iOS and Android, the basic game costs $2. Moreover, the game can be used in numerous classrooms as it offers iterations of varying difficulty: For example, there is Wuzzit Trouble “Math Junior” for K-1 ($5) and Wuzzit Trouble “Extreme” for children 10 years old and up ($6). When bought via Filament Games, an educational game store for teachers, teachers have access to data to better follow and assess their students’ progress and performance. Wuzzit Trouble is an enjoyable game with cute graphics and a simple interface that benefits from an effective game design. Its 75 puzzles offer a nice, progressive challenge, and its third room, the Future Tech Lab, will prove interesting even to older players searching for the most effective solution. To avoid the feeling of repetition, it is probably best to play in short sessions.